As per the title, would appreciate some help as this must be a common issue but the forum search isnt giving me anything relevant. I could swear I had the riing plus fans working when I first booted the software but now if I close the programme the fans immediately revert back to default even though I hit save. Same after rebooting. Is there a way to completely clear cached profiles etc? when I reinstall it seems to remember them. Does anyone actually ever respond on these forums? Or do thermaltake ever bother to get back to support requests I sent them a web note like a week ago - how does a company get away with having support this bad?! I'm just gonna keep bumping this for a few weeks then I guess? @ThermalMike should be able to get you some support. Thanks for responding its more than I've gotten from TT themselves lol. I guess I'll try sending him a message. Bumping again in the hope it annoys someone into helping. Still waiting for literally any contact from TT. After you uninstall the software, see if the Tt folder in C:\Users\username\AppData\Roaming is still there. If so, that may be what you need to delete to wipe out any prior settings. thanks, that got rid of them but unfortunately the problem still persists. Im running an Aorus 7 z370 and 8700k, 32gb corsair RAM on win 10. Thanks both for your replies. You aren't actually closing out of the software from the system tray, are you? You just mean you're closing the software window, right? Tried both. It reverts to default colours when i sys tray close. Also clicking start with Windows does nothing, and even setting it manually to do so through windows it will not start. I have to click the desktop icon with every single boot. I dont think the software needs to run every time anyway. The settings are supposed to save to the fans themselves arent they? It does on one of them anyway. I believe you need to have the software running at all times. You can close out of the window, but it needs to still be going in the system tray. If I exit it from the system tray, my fans go to a default mode. That's why I was asking if you meant closing as in the system tray or just the window. If it reverts when closing the window but letting the software run in the system tray, then that's definitely a problem. 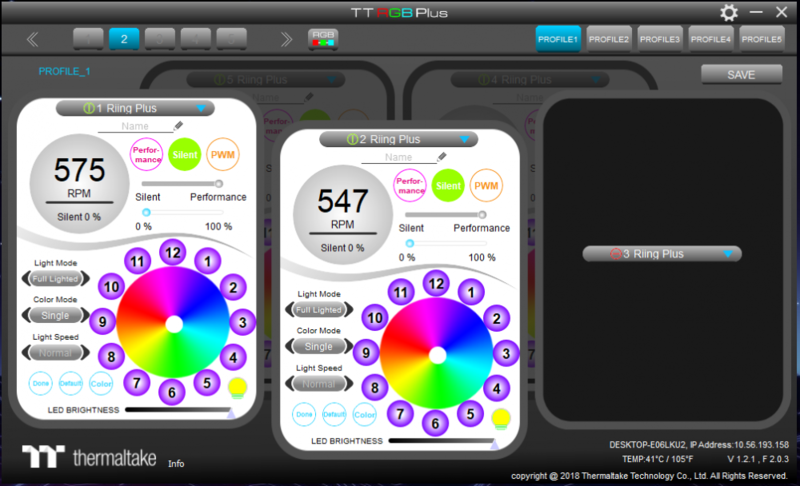 I dont think this is right, as its working properly on 1 of my fans and it remembers the colour even after a reboot. Its just the other 3 that stop working. If I close the software from the system tray they all revert to default. Its really confusing. I'm definitely tempted to just return them this just isn't acceptable from a company to sell a product that doesnt work and then offer zero support. Possibly the worst experience I've ever had from a component manufacturer, at least other companies respond to your emails. Their support is terrible. I initially tried via phone, left a couple of voicemails, and email to contact them several times on a question I was having. I eventually posted on here and then PM'd Thermalmike, as I saw he was the main contact, and got my issue resolved. A month later I got a call back from Thermaltake. Compared to others, everything easily worked on my system, so I'm sticking with them for now. I think you definitely should have returned the product before your return window was past. I hope you eventually get some support. Wow this obviously took you a lot of effort and time to write out, and it worked perfectly - everything is great now. Thank you so much for your help with this I'm really grateful. I have the same issue.. I contacted Thermaltake and they sent me a new controller no questions asked so I thought it was a common problem.. but nope.. still the same problem with the new controller.. Is anyone from thermaltake actually looking at these posts? would appreciate a heads up... The software also starts maximised.. which is so ridiculous for an always on background app? The fans are nice but not worth this much trouble..
At least support actually replied to you! I emailed them twice and didnt get so much as an "we have received your email and will get back to you". I think its more of a tick in a box for them rather than actually wanting to help customers. Worst experience I've had with any company in a while.